Despite all the negative publicity surrounding fats, we need to start off on the right foot and think of fats as a baker's ally. Fats primary role in baking is to “shorten” or tenderize. The term “shortening” really applies to any fat used in baking; be it butter, margarine, vegetable oil, lard, and, obviously, vegetable shortening. Baking Fat by its very nature coats the protein molecules in flour, making it difficult for them to combine and create that stretchy material called gluten. Any gluten strands that do form are shortened, rather than lengthened, as is the goal with fat-free hearth breads. There are two types of baking fat used in baking, SOLID FAT, such as stick butter or margarine or shortening, or LIQUID FAT, such as vegetable or olive oil. Most baked goods, such as piecrusts and cookies, have to be made with a solid fat, to attain their distinctive texture. Even solid fats vary in their melting points enough to make a difference in texture between cookies made with shortening and those made with butter. Butter has a lower melting point and the resulting cookie will be softer, flatter cookie than if made with shortening. Lard will produce a different result in a pie crust than will butter. And butter cannot be substituted for suet in a steamed pudding without changing the results. So, why use vegetable shortening instead of butter, or margarine instead of shortening? Each has a slightly different melting point and taste, and each will yield a slightly different final product. Become familiar with the information I will provide you on baking fats and you should be able to decide which fat to use or how to substitute one for another. Butter is probably the #1 used baking fat, primarily because it is all natural and has the most mouth pleasing taste of all the fats. This byproduct of milk is 80% fat with the remainder water and milk solids. Butter comes either salted or unsalted sometimes referred to as sweet butter.” The amount of salt in the butter can differ from one manufacturer to another which is why so many recipes call of unsalted butter. Although whipped butter is still butter, it's had air and sometimes water beaten into it so it is expanded and can't be used successfully in most recipes with the volume measurement that recipes call for. Butter is made up of several types of fats; slightly more than half is saturated, a bit more than a quarter is mono-unsaturated and the remainder is poly-unsaturated. It also contains some cholesterol, but it also contains some calcium, potassium and lots of Vitamin A. The melting point of butter is just about at body temperature, which is why it has such a wonderful “mouth feel.” Because of the milk solids in it, it begins to burn at a lower temperature than vegetable oil. Butter has another attribute that is significant in baking; it tastes wonderful. When you do use it in baking, buy the best. All butter is not the same. Good butter is very firm which means it will hold more air in creaming which will help leaven cakes and it will create a flakier result in a pastry. If butter is overworked and warmed too much it will melt into the flour, changing the texture of whatever you're baking, this is easy to do when using a stand mixer, like a KitchenAid. This is one of the reasons that recipes tell you to mix or knead just until the dough comes together. 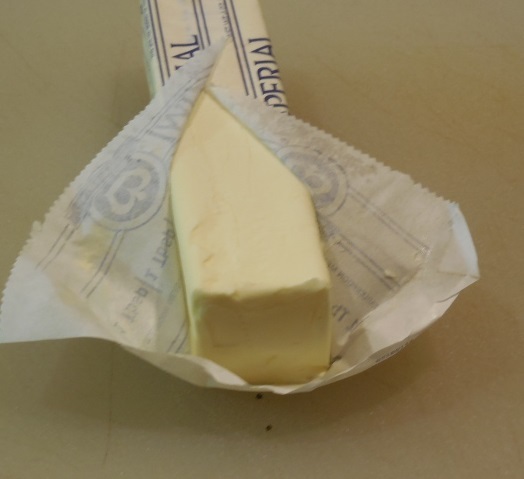 When substituting butter for lard or vegetable shortening in a recipe you may need to use more butter and less water, since it is also about 8o% fat with the rest mostly being water. Salted butter will keep almost half a year if stored where it is dark and not subject to a lot of temperature fluctuation. 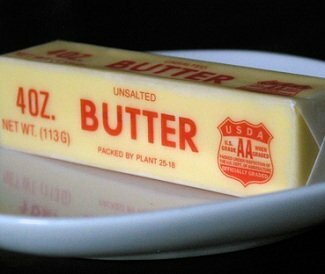 Unsalted butter has a shorter shelf life, about a quarter of a year. But either way, it's best to buy what you need and use it up fairly quickly. This butter substitute has been around for well over a century. It was first developed in 1869 by a French food research chemist, responding to a directive by Napoleon to find a substitute for butter, presumably because it would be cheaper to make than the original. 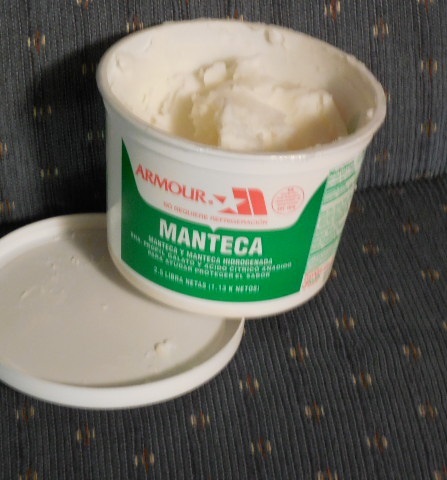 The original margarine contained a lot of animal fats combined with some vegetable oils. Today most margarine is made almost entirely from vegetable oils, with added skim milk or whey solids in some brands. And, like butter, they must be, as mandated by the USDA, at least 80% fat to mimic butter. They also must be fortified with vitamin A. Diet or light margarine is simply margarine that has had air and/or water whipped into it. Like whipped butter, it can't be used successfully as a baking fat substitute in baking. In general, I don’t like to use margarine as a baking fat; it seems an inferior compromise between butter and vegetable shortening, with flavor not matching butter's, and a melting point not as favorable as shortening's. Lard was the primary baking fat available to our ancestors. It is made up of about 40% saturated, 50 % monounsaturated, and 10 % polyunsaturated fatty acids. I have not used lard in any Biscotti recipes, at least not yet! Just make sure the lard is fresh, and keep your serving moderate. 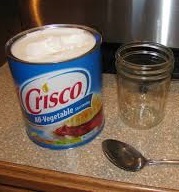 Lard will develop an off flavor fairly quickly, so try to buy it fresh, and use it soon. The best lard is known as “leaf” lard which comes from the fat around the kidneys of a pig. But most lard is rendered from pork trimmings. This is likely the kind you'll find at the grocery. It tends to be milder in flavor and more homogenous in texture. Both are 100% fat and are softer and oilier than other solid fats. Because of its characteristic structure, lard makes the flakiest crust possible. Lard has a large crystalline structure, it works exceptionally well in biscuits and pie crusts, but won't create as fine a grain in cakes as butter, margarine or shortening. It is somewhat soft even when cold, so when making pie dough, some of the fat coats the flour, inhibiting much of the gluten development. The remaining fat, which stays in larger flakes, melts at a slightly higher temperature than butter, keeping the layers of flour and water separate. This also allows what little water is in the dough to turn to steam and separate the layers further. This is why this baking fat creates the flakiness pie crust. Again I have never used suet in a biscotti recipe, and I know little about its use in baking so I will do my best to cover it. Suet is the equivalent of leaf lard (which is from pork) but comes from the area around the kidneys of cows and sheep. Many supermarkets will give you “suet” that really isn't suet, but fat from other parts of the beast, for feeding birds. So if you have a recipe that calls for it, make sure you let your butcher know what you're using it for so you get the appropriate version. Suet is used primarily in steamed puddings. Because it has a higher melting point than butter, it creates a very different texture in a finished pudding than will butter. If you try to substitute butter for suet, once it's in the oven, it will melt before the pudding has a chance to “set” which results in something quite heavy and “greasy.” Suet doesn't melt until the batter has begun to set so as it melts into its surroundings, it leaves tiny holes that make the pudding light. If you feel you just can't use suet, vegetable shortening with its similar melting point is the best substitution. It will definitely change the flavor and character however. Vegetable shortening is made from vegetable oils and is thus 100% fat. To make this fat solid at room temperature, these oils have been “hydrogenated,” chemically treated to change some of their polyunsaturated fatty acids to saturated fatty acids. This also gives it baking qualities necessary for many recipes as well as to prolong its shelf life. Unfortunately, hydrogenating the vegetable oils transforms something that was nutritionally a “good” fat into one that's not. But, unlike the vegetable oil it was made from, and like butter, it can be creamed. As a result it can be used for such things as butter cream icings. Because it is all fat, this makes these icings more stable than those made with butter which can begin to separate at warm temperatures. But you trade stability for flavor. And shortening does make pie crusts that are almost as flakey as those made with lard. In pie crust dough in which the pieces of fat are layered into the flour, shortening serves as a buffer between flour and any liquid that is added to hold it all together. As the crust bakes, the water turns to steam, forcing the flour/shortening layers apart and holds them apart until it melts, by which time the crust is set. This produces the classic tender, flaky piecrust. High-sugar cookies tend to spread as they bake; but if you use shortening rather than butter, its higher melting point will force the cookies to keep their structure long enough for the other ingredients to set, thus preventing spreading. 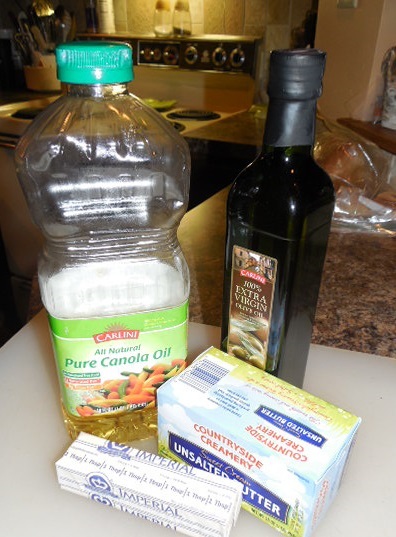 More commonly known as oils, come primarily from plants: seeds, nuts and vegetables. They all contain the same amount of total fat per tablespoon. But they vary greatly in percentage of saturated fat, with coconut oil checking in at 92 percent saturated fat, while canola oil contains only 7.6 percent saturated fat. When you can choose an oil that has a high percentage of polyunsaturated and/or monounsaturated fats. Olive oil is the highest in monounsaturated fat, but its flavor usually isn't suitable for baking, except in the case of bread and Biscotti, especially savory versions. Oils can be used in baking where you don't need to “cream” or beat air into a fat. They moisten, tenderize and help retain freshness. Liquid fats won't provide any structure in your cookie, cake or pie; but it does a good job “shortening” gluten strand. It's fine for enhancing the texture and flavor of sandwich breads, muffins, quick breads, or other baked goods that don't depend on solid shortening for their structure. Olive oil works well in biscotti, making for good crumble and keep the cookie a bit softer than those made with solid fats. The type of oil best suited for most baking should have a light and unobtrusive flavor, like light olive oil or a blend of olive and canola. Stronger flavored oils, such as extra-virgin olive, peanut or sesame are best used for other purposes. As with anything having a high fat content, it's important to store them in an airtight container where it's dark and cool place to prevent rancidity. 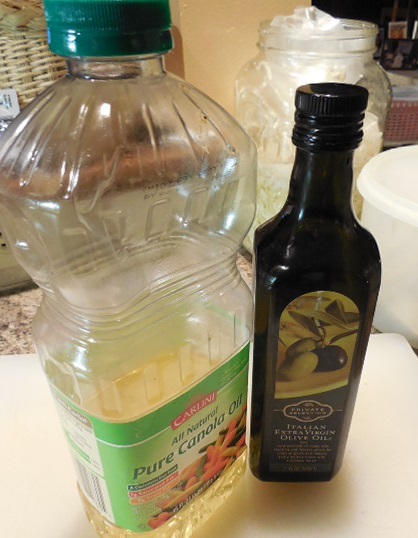 A lot of people try to make recipes healthier by substituting the fats with something else. Applesauce, for example, is a common substitute in baked goods like cakes and cookies. Feel free to try substitutes like this, if you have some knowledge. I have not done much substitution for fat so I don’t have enough experience to advise you on them. As time permits I will do research and try different substitutions, at that time I will publish what I know.